grass stains: Coffee punch FTW! I've seen more complex recipes for Coffee Punch ... recipes that call for Cool Whip, coffee liqueur, sugar and other things. But I'm here to tell you: PLAIN coffee punch is one of the best things you can serve at any gathering, and most everyone will love it. 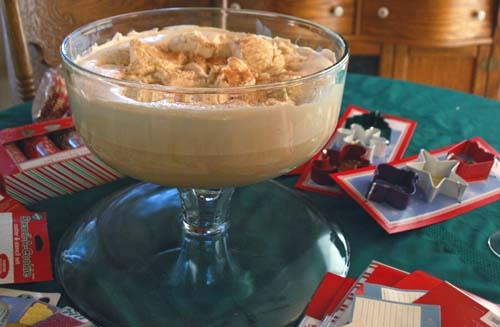 Put a half-gallon of vanilla ice cream and a half-gallon of chocolate ice cream in a punch bowl. Cut them into large chunks with a knife. Pour a brewed pot of coffee over them. (I like French Vanilla or a caramel coffee blend of some kind.) TA-DAH! And if you generally keep ice cream in your freezer, you can do a single serving by putting two small scoops of ice cream in your coffee cup, then pouring coffee over that. It looks sort of like this one, from MommyTopics, but their recipe is more complicated than mine. If it's a baby shower, you can make it with decaf coffee so the guest of honor can drink it. Guaranteed crowd pleaser, either way. Enjoy! Even people who don't drink coffee often like it ... the ice cream makes it sooooooooo delicious! I used to make these all the time when I was in college. I did start putting cool whip in mine eventually, but mostly just vanilla ice cream, coffee and maybe chocolate fudge sundae topping. Paige ... Cool Whip. GAH. Will have to try that. Sundae topping. GAH. Another experiment.